William de Soulis lived from about 1280 to about 1320. From 1318 to 1320 he was Lord of Hermitage and he was a man so deeply unpopular that there are two quite separate tales told of his demise. Whichever way you look at it, William de Soulis seems to have been an unpleasant man, even by the standards of his many unpleasant contemporaries. You can take your pick between the stories of how he met his end. One is rather ordinary and, probably, historically accurate. The other combines deeply evil deeds, supernatural horror, and an especially gruesome but fitting end for the villain. The second version is based largely on a ballad popular in the Borders in the 1700s, which may have been based on earlier folk stories. 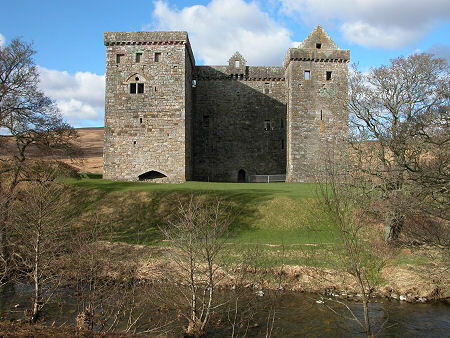 As background, the de Soulis family had been connected with forbidding Hermitage Castle in Liddesdale, close to the English border, since 1249, when Nicholas de Soulis built a wooden castle here. In 1318, his descendant, William de Soulis, became Lord of Hermitage. It is unlikely that the original wooden castle had yet been replaced in stone, but today's Hermitage Castle is an oppressive and chilling place that gives credence to even the most fanciful of the stories concerning William de Soulis. But first, the boring, historical bit. Border lords at the time were always having to look closely at whether their interests were best served by siding with the English or the Scots, and it seems that in 1320 William de Soulis took part in an English-inspired plot to kill the Scottish king, Robert the Bruce. 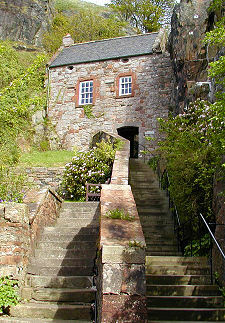 It failed, and the participants were rounded up, with de Soulis being imprisoned in Dumbarton Castle, where he subsequently died. The second version takes a little longer to tell. William de Soulis was a huge and physically powerful man, and when he became Lord of Hermitage in 1318 he rapidly demonstrated a deep vein of cruelty that quickly had him loathed by all who came into contact with him. Stories began to circulate that he practiced the Black Arts, kidnapping local children and using their blood in dark rituals at Hermitage Castle. During these rituals, de Soulis would summon up his familiar, Robin Redcap. A redcap, also known as a powrie or dunter, is a type of evil goblin, typically found in British folklore in ruined castles along the border between England and Scotland. Once summoned they roam the area, killing travelers and residents in order to keep fresh the bloodstains on the redcap's hat: because if these stains dry, the redcap dies. Redcaps are very quick, despite their metal-bound boots and the heavy pike they carry, and the only way to escape one is to quote a passage from the Bible at it, whereupon it loses a tooth. Robin Redcap was especially feared, and after being summoned by de Soulis committed many evil deeds in the lands around Hermitage. But William de Soulis himself was equally capable of terrorizing his neighbors. One day in 1320 he kidnapped a young Armstrong woman and tried to return with her to Hermitage Castle. When her father tried to stop him, de Soulis killed him on the spot. However, by now a crowd had gathered, and de Soulis was on the verge of being lynched when Alexander Armstrong, the Laird of Mangerton, intervened, calming the crowd and advising de Soulis to return to Hermitage without his captive. De Soulis was far from grateful, instead developing a hatred for someone who, as his social inferior, had demonstrated the power to influence the crowd and save de Soulis's life. De Soulis therefore invited Alexander Armstrong to a banquet at Hermitage, and when he arrived, stabbed him in the back. Complaints about de Soulis's activities were frequently reaching the ears of King Robert the Bruce himself, and when he was told of this latest outrage, Bruce, in exasperation, cried "Soulis! Soulis! Go boil him in brew!" Needing no further invitation, the locals overpowered de Soulis, using a specially forged chain to bind him, as ordinary ropes could not contain his supernatural powers, and took him to the summit of Nine Stane Rig. It was believed that de Soulis could not be killed by ordinary means, so instead he was boiled in molten lead in a cauldron suspended above a large fire. When news reached the king that his words were being taken literally, he sent soldiers to Hermitage: but it was too late, and they were only able to report back what had happened. Take your pick which story you prefer, but both end in de Soulis's death; both end with the confiscation by the Crown of Hermitage Castle; and both end without evoking much sympathy for William de Soulis!